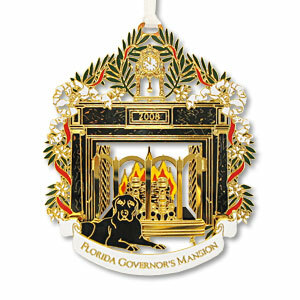 The historic Lafayette Clock, surrounded by Florida orange blossoms and palm fronds, graces a hand-tooled black marble fireplace mantle in the State Room of "The People's House" - The Florida Governor's Mansion. A gift from the descendants of the Marquis de Lafayette, the clock was donated to the state by the heirs of Colonel Robert W. Williams. Replicated in a stunning 24kt. gold finish and crafted in America, this sixth-in-an ongoing series Collector's Edition Ornament makes the perfect holiday gift.